** LISTED RATE IS PER GROUP** Enjoy a private tour of the Metro Phoenix area for your group of up to five guests. The tour can be customized from 3 to 6 hours. The itinerary can be tailored to suit your desires of what you would like to see along the route. 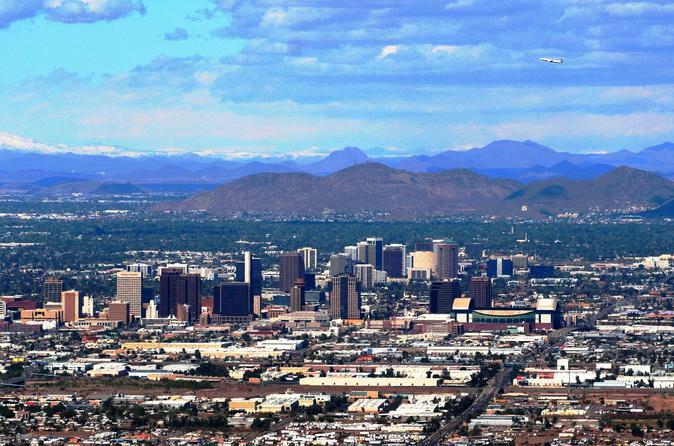 Typical points of interest could include Downtown Phoenix, the Capitol area, Scottsdale, Arizona State University, Glendale, the Biltmore area and more. There are options to spend some free time in places such as Old Town Scottsdale, the State Capitol Building, or Catlin Court in Glendale. Route options and local venues can be discussed at booking. Admissions to venues is additional. This guided tour will begin in the Metro Phoenix area. Pickup at many local area hotels is included by Chrysler Town and Country vans for a comfortable experience. Enjoy learning about the Phoenix area, in the comfort of an air-conditioned van. We will discuss the route with you at booking and you can customize the tour timing, route, and sites. Your expert guide will take you through various areas of Metro Phoenix for up to 6 hours. Opt for some free time to browse the art galleries of Old Town Scottsdale, take in the history at the State Capitol Museum, or visit Catlin Court in Old Town Glendale for antiques and old town charm. Choose an all-driving tour, or opt for a visit to one of our local venues along the way, such as the Heard Museum or Desert Botanical Gardens. There is much to choose from. Admissions to venues paid at the sites. Upon reserving, we will discuss tour options. Focus on certain areas of town, free time for shops and museums, etc. Bottled water is provided. Meals are not included. Dining options can be discussed at confirmation and a lunch stop can be added during the tour. With a private tour, you have complete control of the itinerary and will enjoy your own personal guide of the city.